Acne can affect people of all ages and there are lots of treatments for dealing with acne. You can use products available at a drugstore or cosmetic counter that do not require a prescription. 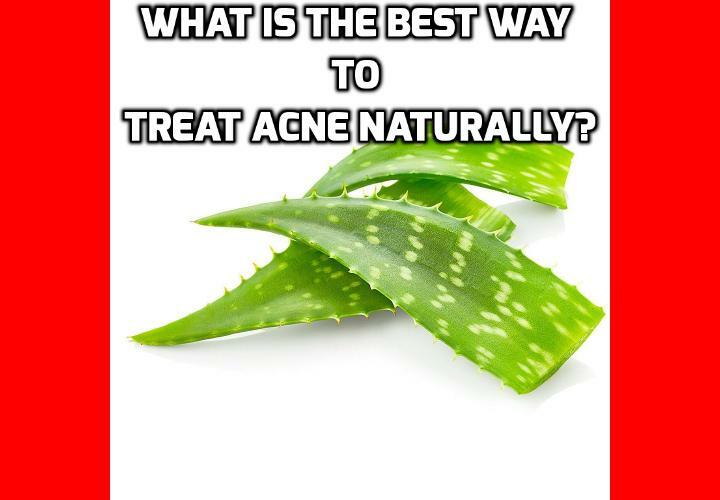 However, you can choose a safer option to treat acne by using the following organic recipes which do not have any side effects and if use regularly can prevent acne or pimples from coming back. To prepare this mask, you will need 1 cup of oatmeal and 1 tablespoon of raw organic honey (or manuka honey). You mix them together to form a paste which you can apply to your face. You leave it there for 10 to 15 minutes, after which you can rinse it off with lukewarm water. Dry your face and apply some oil-free moisturizer. Oatmeal cleanses your skin without drying it. Oatmeal is an effective exfoliant and can help you to unclog skin pores. To make this mask, you will need 2 tablespoon of pumpkin puree and one egg white. You mix both of the ingredients together to form a paste. You can now apply this paste to your face. Just let the mixture stays on your face for 10 to 15 minutes, before you rinse it off with lukewarm water. Dry your face and apply some oil-free moisturizer. Pumpkin is another excellent ingredient for making a mask for acne. Pumpkin is rich in nutrients such as Vitamin C and E and zinc. When pumpkin is used to make a face mask, it can help to moisturize and tone the skin. To create this mask, you will need 2 tablespoons of baking soda and 2 tablespoons of water. You mix both of them together to form a paste. If the paste is too thin, you can add a little more baking soda to get the thickness that you want. You can now apply the paste to your face and let it stays there for 10 to 15 minutes before you rinse it off with lukewarm water. Baking soda is one of the most popular ingredients for making a face mask for acne. This is because it can help you to get rid of oil, prevents pimples. It works as a natural exfoliant in helping to remove dead skin cells and unclog pores. This mask is gentle enough to use several times a week. To prepare this mask, you will need 1 green apple and 3 tablespoons of raw organic honey (or manuka honey). You cut the apple into small pieces and add honey to them. You blend these ingredients in a blender to make a smooth paste. You apply this paste on your face, let it stay there for 15 to 20 minutes before you rinse off. Dry you face and put some oil-free moisturizer on it. If you use this mask regularly, you will not have to worry about acnes or pimples. This face mask can also help you to lighten your scars or blemishes that are caused by acne or pimples. To create this mask, cut an orange into 2 halves. You use one half of the orange to squeeze some orange juice out of it. Then you add one egg white to the orange juice to get a fluffy mixture. You can now apply this mixture on your face, just let it remain on your face for 10 to 15 minutes before you rinse off. Dry your face and finish with some oil-free moisturizer. Orange, like other citrus fruits such as lemon and grapefruit is great for skin. Citrus fruits have natural antiseptic properties that can help you to get rid of germs and reduce oil. This is a very simple mask for acne because it only requires one tomato. What you need to do is you mash the tomato into a pulp and spread it all over your face. You just leave it there for an hour before you rinse it off. As usual, you dry your face and put on some moisturizer. Tomato is rich in both Vitamin A and C. It can cleanse pores which prevent acne formation. Rubbing tomato on your face can help to remove dirt and oil. Besides helping you to cure acne, a tomato mask can give you glowing skin. The problem with acne is that it shows up on your face which is the most exposed part of your body, which people pay the most attention to on a daily basis. This can make a person that is suffering from acne blemishes very self-conscious, lower their self-esteem, and cause unwanted stress. This stress can lead right back to more blemishes, which is a terrible self-perpetuating cycle. So, it is no wondered that people who have acne problems will search for and try out lots of different treatments that are available on the market right now. Most people will not get the results that they want with the conventional treatments because the harsh chemicals actually damage your skin more than they help. For the best results, people turn to natural treatments that are not harsh and do not damage the skin in the affected area. What most people do not want to hear, but it is essential to making natural remedies work, is that you are going to have to look at these treatments as long term projects. These are not going to clear your complexion overnight, but if you use natural solutions, consistently over a long period of time, you will get the results that you are looking for. For the rest of this article I will talk about how you can use tea tree oil for acne and the possible side effects. What is tea tree oil actually? Tea tree oil comes from the leaves of a plant that is native in Australia, the Melaleuca Alternifolia. For this reason, tea tree oil is also known as melaleuca oil. Tea tree oil is an active antifungal, antiseptic and antibacterial herbal remedy that promotes healthy skin thus helping to get rid of scars naturally. Tea tree oil contains terpinen-4-ol, which provides it with anti-inflammatory and antimicrobial properties. So it actually destroys the bacteria that cause acne in the first place. Just one drop of this powerful oil can do wonders on your overall health. It stimulates cell renewal thus making it easy for skin rejuvenation which boosts healthy looking skin. There are several ways in using tea tree oil for acne treatment. One of the side effects of this natural remedy you should keep in mind is to not go out into the sun right after you apply the tea tree oil acne treatment because it will dry out your skin. You should check with your doctor about how this treatment might interact with other medications you are taking after doing your own research. When you use tea tree oil for acne, never apply it in an undiluted form directly onto your skin, as it could result in skin irritation, blistering, itching, redness, and over drying. Therefore, when create your own tea tree oil toner to get rid of scars naturally; you have to mix pure tea tree oil with clean water (1 part of oil to 3 parts of water). You then have to apply this topically using a clean cotton balls every night to help fight bacteria to smoothen your scars. To treat back acne, you can mix 20 to 30 drops of pure tea tree oil on your warm bath and soak yourself for about 15 to 20 minutes three to four times a week. To get the best results, you should do this regularly. Another solution that would do your acne problem a whole lot of good, would be to make a face mask using tea tree oil and use it once or twice a week to get good results. Add two drops of tea tree oil to a sufficient amount of natural green clay powder and make a mask, add some water to help you create a thick paste. You should then apply the paste onto your face and neck and leave it on for 30 minutes. An alternative would be to make a small quantity of this paste and use it only on your acne spots, leaving it on overnight. At the first sign of a whitehead or pimple, you can dab a little tea tree oil onto it using a Q-Tip. Within 24 hours you will see it shrinking in size and that it will not proceed to become a hard cyst. Do you want to quickly do away with your unattractive scars and finally have that Scar-Free skin you have always desired to have? If yes, then I suggest you use the techniques recommended in Lleaon’s Beauty Secrets. Click on this link ==> DIY Organic Skincare Recipes Book to read more about this Natural Skin Care Program and see how it’s been helping thousands of people round the world, to effectively treat all their scars and other skin problems enabling them to have a clear skin tone. Fighting off acne at home!